Moving Average Scanner Pro is a multi-currency & multi-timeframe indicator which can scan from a single chart. 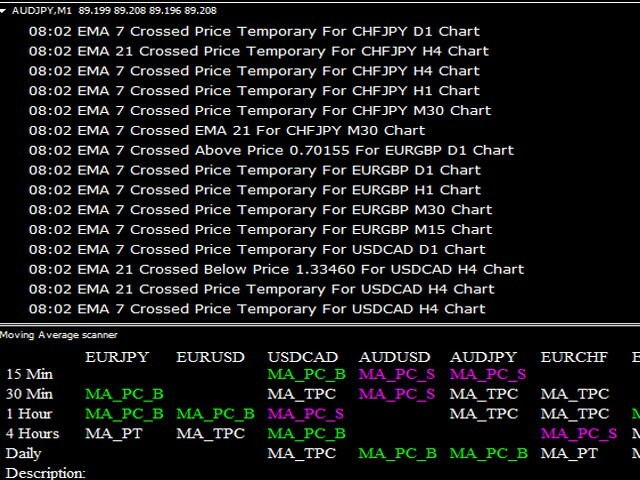 Track up to 15 currencies and all the timeframes from 1 minute to 1 month from single chart. 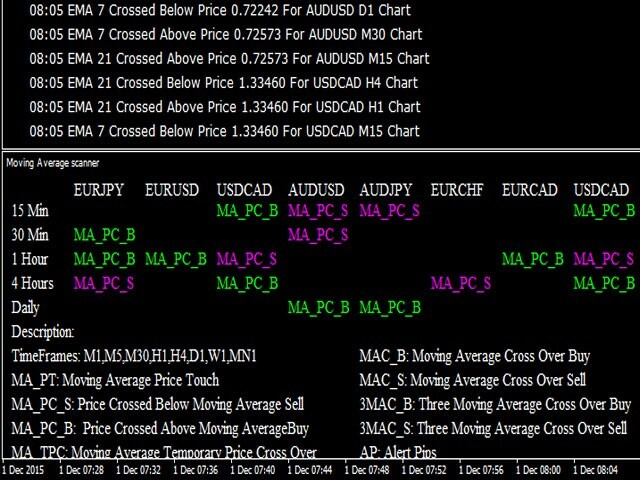 Scan price touch, price crossover, temporary price crossover, Moving Average crossover. I have been trading since many years now. I always wanted a system which can alert me when price touches a Moving Average or price crosses Moving Average or Moving Average cross any chart and on different timeframe. In this way I don't have to keep watching my charts all day and I can track easily 15 currencies and all the timeframes at the same time from single chart. Moving Average Crossover (true/false): It will alert if two Moving Average crosses on candle close. We have 3 Moving Average crossover settings too. You can set alert up to 15 currently and all the timeframe from single chart and get alert on screen, mobile or email. Price Touch (true/false): It will alert as soon as price touches Moving Average. For this it will check for fast MA, medium and slow if they have entered the parameters. For example they have set parameters for fast and medium then it will check that only. Note it's not Moving Average crossover. it's just the price touch to Moving Average. If you want to get alert when Moving Average 21 touches price on EURUSD on 4H timeframe and EURJPY on Daily chart then you will get alert on screen, email and mobile. Moving Average Cross Over Price (true/false): It will alert on candle close and if price has closed below or above Moving Average. For This it will check for fast MA, medium and slow if they have entered the parameters. For example current price closes below MA 21 or any parameter you entered you will get alert. Note this is not Moving Average crossover its price crossover. Temporary Price Crossover (true/false): It will alert on candle close but only if price goes below or above the MA and comes back above or below the price. For example current candle price goes above MA51 or whatever parameter you have entered and close below MA51 in the same candle then it will send alert. In this kind of setup mostly price will not break the Moving Average and expect a reversal. 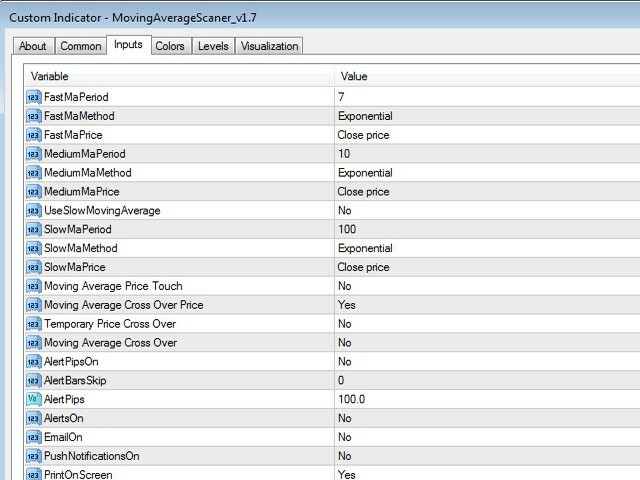 MovingAveragePriceTouch (Yes/No): If you select Yes it will give you alert whenever Moving Average touches current price. MovingAverageCrossOverPrice (Yes/No): If Yes it will alert when price closes above or below Moving Average. TemporaryPriceCrossOver (Yes/No): If this is Yes it will alert you if price goes above from below Moving Average and closes back below. MovingAverageCrossOver (Yes/No): This will alert you if MA crossover. You can select 2 MA or 3 MA crossover. AlertPipsOn (Yes/No): If you want to get alert as soon as MA is away from X number of pips use this. 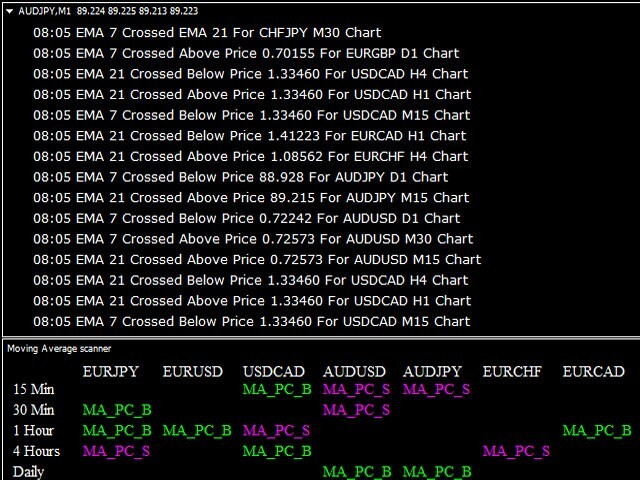 Example you can set 50 pips so when ever MA is 50 pips away from current price it will alert. AlertBarsSkip (x Bars): For example you don't want to get alert for next 3 bars once you get alert you can set number of your choice and it will not give any alert. There are more than 50 ways you can set the indicator to scan currency and get alert. If you want to know different ways of using this indicator feel free to PM me. Combine this strategy with https://www.mql5.com/en/market/product/5203 and you can be a true price action trader. To get best results use on timeframes above H1. This product does help in identifying moving average crossovers. The Seller says we should combine this indicator with the Candle Scanner Pro. I am not so sure I am comfortable adding because of the reviews of that indicator. Especially when someone writes "Still too early to be sure about this product" and gives it 5 stars? This is a very powerful instrument. 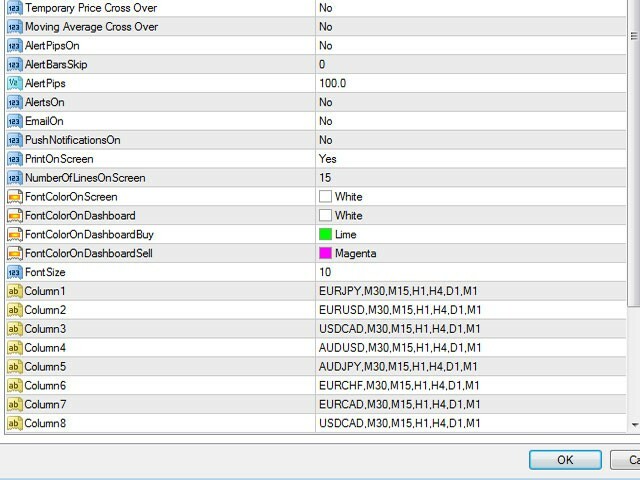 The settings are also very good for scalping. Thank you! very good product! It save me a lot of time!